Four tires on the road are always better than two. If you have tire trouble you can often “limp” to the next service facility rather than being broken down on the side of the road. 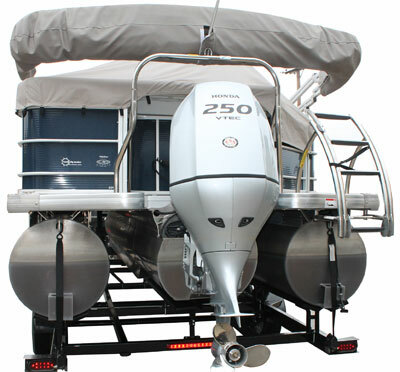 With four tires you have greater carrying capacity for heavier modern pontoon boats. 22’ Sylvan, although it could be a Smoker Craft or Starcraft, on our PT-24T. A perfect fit. Front view. 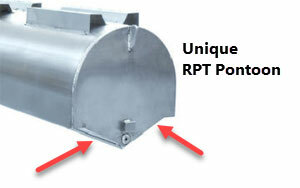 This image shows how good our standard bunks fit the unique Sylvan RPT tubes. 24’ Bentley on our PT-24T. Another perfect fit. Our 2016 trailers have galvanized instead of painted rims. A Bennington 2250RL being picked up at the factory. A perfect fit. with wider steps shown to the right. Bennington 2550 on our PT-26T. A perfect fit. 22’ Aqua Patio with a 250 HP Honda (by Nautic-Godfrey) on our PT-24T. Aqua Patio AP-240 on a PT-24T. Big engines don’t bother us, even inboard-outboards. Our tandem axle trailers have two vertical braces to support the back of the trailer and tie it into the rest of the frame. These two braces distribute the weight of big engines closer to the axles for a better ride. Craig’s List. 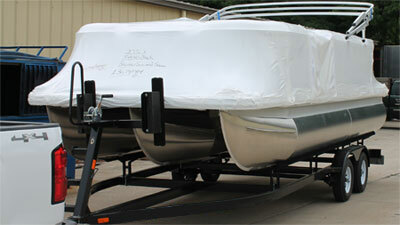 Many quality dealers are packaging our trailers with new boats, but some aren’t. Even if you’re only going on one long trip, you don’t want to bounce your tow vehicle to pieces. Perfect Balance. 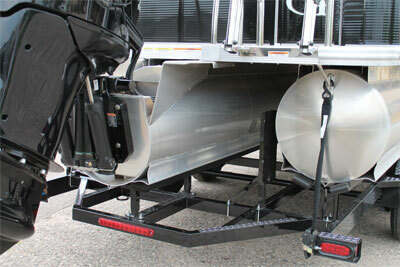 We recommend the hitch height be about 18”. 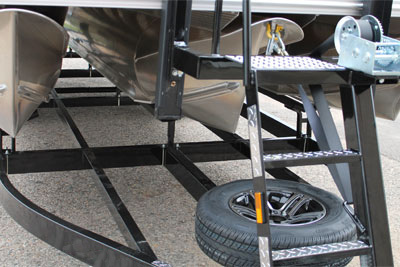 In the picture above, the boat-trailer-tow vehicle are perfectly level. It will tow effortlessly, the suspension will work perfectly. 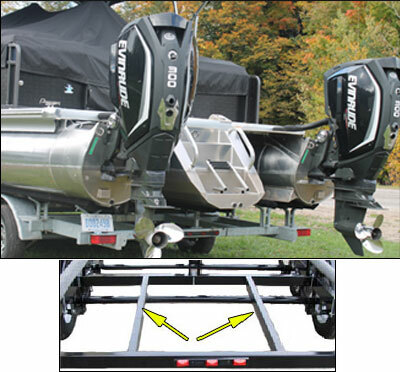 Just a few inches higher or lower throws the balance of the trailer off and makes the suspension work harder, resulting in a rougher ride. If you’re off more than a few inches you’ll feel the load behind your tow vehicle and in extreme cases you may carry the load on just one axle. A 26’ Avalon/Tahoe Grand Island on our PT-26T HD with stern extension and dress up kit. 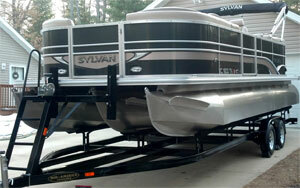 This is the customer’s second trailer for his new boat. The one he got from the dealer in Minnesota with the boat seemed to be a big heavy trailer (5” frame and 14” tires). But when he towed it home to Indiana, it shook and vibrated so bad that he was afraid to tow it. He came to us skeptical about trailering. We transferred his boat onto one of ours. He ran up to the toll road and towed it a few miles at 70 MPH and returned to buy. To dealer restocked the first trailer and our trailer was actually less money, but the customer had to it return it to Minnesota. Stern Extension with Dress Up Kit and tie-down straps. Load guides on back of frame. Dress Up Kit on winch stand. 3200 lb. winch. Full length frame reinforcement and alum rim spare.